The HIIT Trainer is one of the newest additions to ProForm's elliptical lineup, offering a new way to workout with faster results in a shorter period of time. You can burn more calories and get a more efficient cardio workout, all while enjoying the many features these hybrid machines have to offer. The HIIT Trainer is black and silver with fire red accents with a bright 7" backlit display. It takes up half the space of the typical elliptical, making it a smart choice for the home gym. 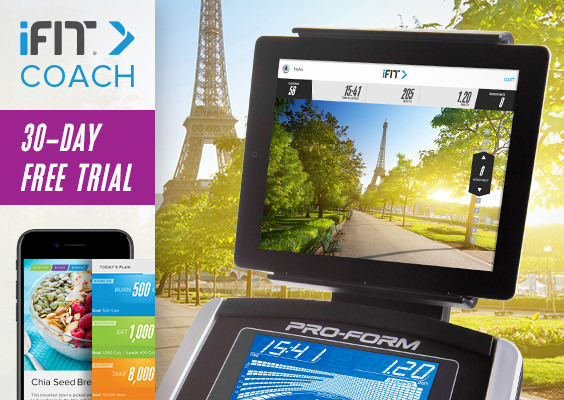 The new ProForm HITT Trainers have received good reviews thus far, as users are happy about the ability to burn more calories in a shorter period of time. You are essentially getting two machines in one, sort of a stepper with elliptical arms and more freedom of movement. It is very similar to the popular Bowflex Max Trainer, with the same type of movement and focus on interval training. The HITT Trainer gives you a little more than the Max Trainer, however, with 24 different resistance levels to choose from and 32 workout programs. We like the multigrip handles which allow you grasp the machine multiple ways, so you can choose whatever grip is most comfortable for you. You also have iFit Coach, available with a yearly membership fee, which gives you Google map integration to choose a location anywhere in the world, an unlimited array of additional workouts and the ability to track and monitor your progress over time. You can view iFit on your tablet or smart phone, as opposed to right on the elliptical itself with the up-level HIIT Trainer Pro model. That model has a touch screen display with internet capability. Other features include iPod compatibility for your music, a CoolAire workout fan, oversized cushioned pedals, water bottle holder and transport wheels. Anything we didn't like? Not really. It does not have wireless heart rate monitoring like the Pro model, but for the price you can't really expect that. All in all this is a great hybrid elliptical for the home gym. How Does the ProForm HIIT Trainer Compare to the Other Ellipticals? The HIIT Trainer is different than the traditional ProForm ellipticals, in that it is a combination of two machines in one, so you really can't compare the two. Both will give you a great workout, but the HIIT Trainer is more geared towards interval training and calorie burning. A better comparison would be the ProForm HIIT Trainer vs the Bowflex Max Trainer, as the two machines are quite similar. Price wise, the fairest comparison is to the base M3 model. The base HIIT Trainer features a 10" vertical climb and a 5" elliptical path, a 7" LED display, 32 workout programs, grip heart rate, 24 resistance levels and a pretty solid warranty: Lifetime on the frame, 3 years on parts and 1 year on labor. You also get a workout fan, music port and access to the company's patented iFit Coach technology. There are limited specs available on the Bowflex website, so it's hard to make a complete apples to apples comparison. The M3 gives you a basic LED with Burn Rate meter, 2 workout programs, grip and wireless heart rate monitoring, 8 resistance levels and a 1 year warranty. So when you're comparing the ProForm HIIT Trainer vs the Bowflex Max Trainer M3, it comes out ahead in most categories. It gives you many more workouts and resistance levels than even the top of the line Max Trainer M7, plus a much better warranty than any of the Bowflex models. The Max Trainer does have the unique Burn Meter showing you your calories burned per minute...so the edge on the display might go to Bowflex. But otherwise, ProForm has them beat. So overall the HIIT Trainer is probably a better machine with more versatility and better overall construction, but the Max Trainer remains more popular at the moment, as it was the first of its kind and will likely be hard to surpass. You know what they say about "first to market"
What about the HIIT Trainer vs the HIIT Trainer Pro? The Pro version is an advanced version of the base model, as you might have guessed from the name. 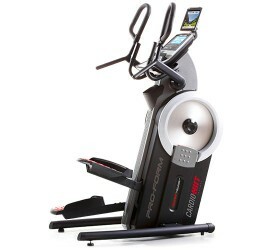 The workout is the same, and both machines will give you solid results, but the Pro version adds a 10" Smart HD touch screen like you find on some of the higher end ProForm ellipticals. You also get 2 additional workouts, a slightly heavier flywheel, more resistance levels and a longer warranty. The HIIT Trainers are competitively priced, at around $999 for the base model and $1599 for the Pro model. The Pro is priced around the same as the mid-level Bowflex Max Trainer M5, but it has that model beat for the same reasons we mention above. Plus no Max Trainer comes with a touch screen console...for now. The new ProForm HIIT Trainer is great for those who want to burn a lot of calories and get an efficient workout. It's space friendly, well designed, and has a ton of workouts, resistance levels and capabilities. For under $1000 on sale, you'll be hard pressed to find an elliptical that offers you more. If you want the touch screen and even more features, check out the Pro version as well. Also look at the very similar Bowflex Max Trainers, which are also ellipticals and steppers in one machine...although they don't have all of the features of the HIIT Trainers, you may find them appealing. The ProForm HIIT Trainer elliptical is on sale right now!